Language Drop-down Menu (only in Multi-language edition) - PHPKB knowledge base software provides you with the facility to create categories, articles, news, glossary items in languages of your choice. PHPKB supports multiple languages including the ability to create and edit language files, create language translators, assign language translators etc. The multi-language version comes with default English language file that cannot be deleted. However, you can click the language displayed at the right side of admin area to change the language accordingly from the language drop-down menu. You can also add a new language or manage the existing language files. For more details refer Manage Language Files article. Navigation Bar - With left side navigation panel you can create, configure and manage your knowledge base. Description for each sub option of navigation panel is added to express its functionality. 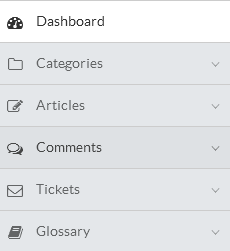 Navigation panel contains links to Articles, Categories, Admin Dashboard, Comments, Tickets, Glossary, News, Users, Groups, Statistics and Tools. Dashboard: When you log in to the knowledge base, the screen displayed is the admin dashboard which presents and organizes your daily usage information in an easy to read way. Categories: Categories are used to structure knowledge base into easily manageable portions. In PHPKB knowledge base, categories are represented in tree based structure. You can perform various actions like add, edit and delete categories in this section. Articles: These are the content of knowledge base. Articles can be your frequently asked questions, white papers, user manuals, or troubleshooting information. You can create articles, manage articles, saved drafts, templates, trash box, subscribers or custom fields in this section. Comments: You can click here to manage the comments submitted by the users. Tickets: Questions submitted by the users in front-end are displayed as tickets in the admin area. 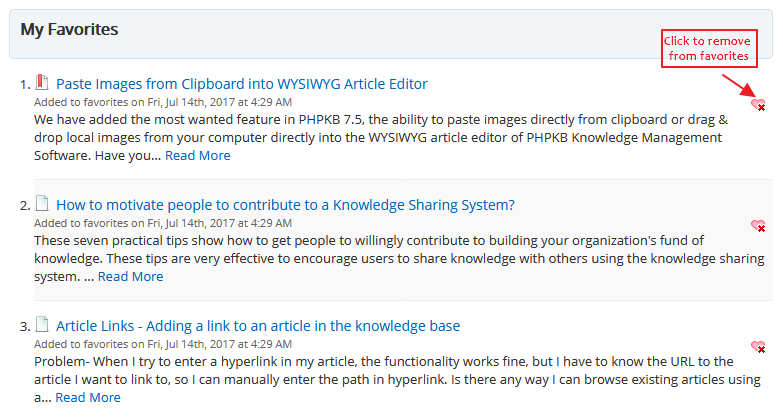 Admin users can reply to these tickets and publish them as an article in the knowledge base. Glossary: Click here to create and manage glossary of frequently used terms. Glossary terms are highlighted where they appear in the article content in front-end and appropriate description is shown on mouse over. News: You can add and manage news of your enterprise in this section. Users can read the news in front-end or you can hide the visibility. 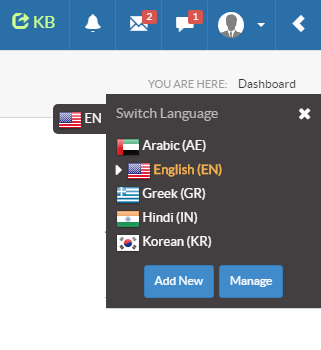 Languages: With the multi-language edition of the software, you can add or manage different languages in this section. This feature is not available in the non-ML edition of the software. Group: User groups can be associated with protected categories only so that front-end members of a particular user group can access the content under those categories. 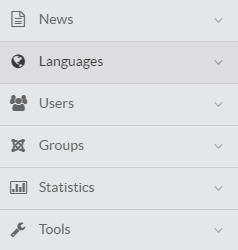 User groups can be created edited or deleted under this section. Statistics: You can view the graphical or donut chart representation of knowledge base components such as articles, categories, users, search keywords, article traffic & failed login attempts in this section. Tools: Under tools navigation tab, you can configure your knowledge base settings, generate sitemaps, optimize and backup of your database. Users: Different level of users can be added, managed or searched in this section. Other Details - You have the access to view user details, login history, your favorites and product details. You can click this to expand or collapse the right side panel. See above figure in the header section. User Details: It displays name, username, level and email-address of the user along with the date when user get started working with the software and groups he/she is associated with. Login History: It consists of a list that shows the details of last login attempts with date, time and IP location of the system used by the user. My Favorites: It displays a list of your favorite articles which you have marked as favorites in KB front-end area. Click the article link to view article in front-end. You can click Manage Favorites button to remove the article from the favorites list. It will redirect you to ’My Favorites’ page in front-end area (See figure below). Product Details: This deals with the server details (PHP version and MYSQL server version) and other details of PHPKB software. Workspace Area - PHPKB workspace is the area where you can manage, view or edit the contents or settings of your knowledge base. You will learn how to use admin control panel further in detail.